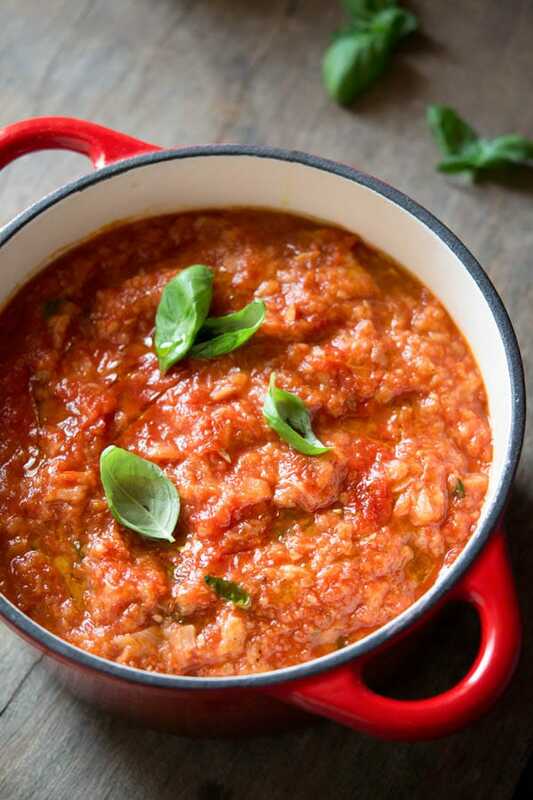 Tuscan Pappa al Pomodoro – tomato bread soup made with tomatoes, garlic, basil and bread. This soup can be eaten at room temperature in the summer or slightly warm in the winter for a simple, filling and delicious meal. 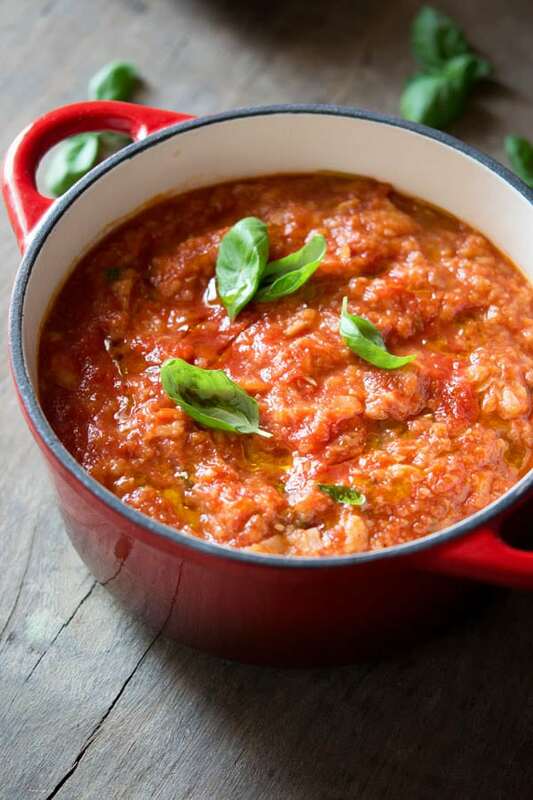 Pappa al Pomodoro is one of the oldest Florentine recipes, originally it didn’t contain tomatoes and consisted of only bread, garlic, and stock. Its consistency is very much like oatmeal or porridge making it a filling meal all on its own. Ok, tomato bread soup might soup strange to some people and I know that soggy bread turned into what looks like oatmeal might not sound appetizing but seriously it is! I was so interested to try this old Florentine recipe when I first came across it in many recipe books. I absolutely love Florence and dream of moving there one day, there’s just such a buzz in the city and I mean it is jam packed full of art, history and extremely delicious food. There’s something about it that reminds me of Edinburgh, it’s so easy to know your way around, I feel comfortable there like I can be myself and to me it just feels like home, do you ever get that with places? For now, I’ll just have to settle for the boring old Siena countryside, rolling hills and postcard landscapes, poor me, right?! So, when I tried pappa al pomodoro for the first time I was seriously blown away by how tasty it was and how much I loved the texture. Do not be turned off by it, it’s hearty and substantial and the bread soaks up every ounce of flavour. This is proper poor man’s food (cucina povera) it’s simple, hearty, easy and costs very little to make. I absolutely love this dish and I think it’s because I love to be cosy eating hearty, comforting food. That being said this is a dish that’s very much eaten in the Summer at room temperature, never serve it hot even in the winter. It should always be just warm or room temperature. Add a little oil to a large pot under a medium/low heat, add some finely chopped garlic and sauté for a few seconds. Add good quality chunky passata/pureed tomatoes (it’s very important to spend a little extra on a good quality brand, I recommend Cirio). Add a pinch of pepper and bring to a boil. Once boiling at the vegetable stock, stir and bring it back to a boil. Once boiling turn the soup down to a simmer and let it simmer for 15 minutes uncovered. Slice some good quality Italian crusty bread (a great way to use up stale crusty bread) and add the slices to the soup. Very gently push the bread down into the soup a little without breaking it it, don’t worry if it’s not all covered. Remove the soup from the heat and leave it to rest, covered for 1 hour. leaving the soup for one hour gives it plenty time to cool down to a perfect temperature for serving and soak up all the flavours. 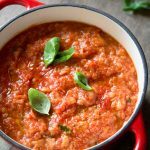 If you’ve tried this tomato bread soup or any other recipe on the blog please let me know how you got on in the comments below, I love hearing from you! You can also FOLLOW ME on FACEBOOK, TWITTER, INSTAGRAM and PINTERESTto see more delicious food and what I’m getting up to. 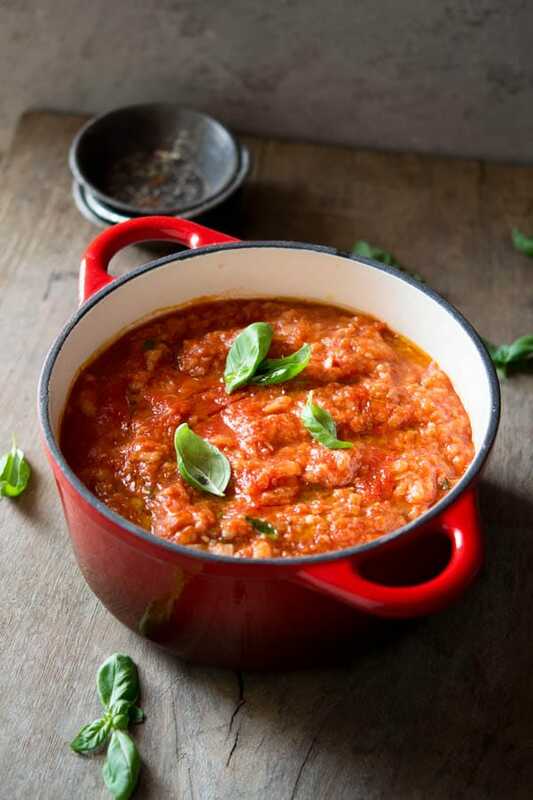 Tuscan Pappa al Pomodoro - tomato bread soup made with tomatoes, garlic, basil and bread. This soup can be eaten at room temperature in the summer or slightly warm in the winter for a simple, filling and delicious meal. Add the olive oil to a large pot on a medium/low heat. Finely chop the garlic and add to the pot with the chili flakes, sauté the garlic for 30 seconds, don't let it brown. Add the pureed tomatoes and bring to a boil. Once boiling add the vegetable stock, bring back to a boil then reduce the heat to a simmer. Let the soup simmer gently, uncovered for 15 minutes. Roughly chop a little basil and add it to the soup. Finely slice the bread and add that too, very gently push the bread down without breaking it apart into the soup, don't worry if it's not all covered. Remove from the heat and let it rest, covered for 1 hour. Stir the soup to break up the bread into a porridge/oatmeal like consistency. Adjust the texture with a little vegetable stock if it's too thick. Serve warm or at room temperature. Omit the chili flakes to make it more child friendly. I can’t even tell you how much this is making me salivate, the photos are so good. The texture looks utterly perfect, this is my idea of comfort food. Perfect for when one’s feeling under the weather! This looks like the best kind of comfort food!! Yum! I have never tried tomato bread soup! Sounds delicious! This looks so good. With all the fresh market tomatoes right a peak season, this is the perfect way to enjoy them for sure.